Tue., Jan. 22, 2019, 4:59 p.m.
NORMAN, Okla. – University of Oklahoma students demanded more from their campus administrators Tuesday, hours after the school released public apologies from two former students who were involved in a video in which one of the women wore blackface and used a racial slur. About 1,000 students and faculty members gathered at a campus rally Tuesday during which administrators condemned the video in which a white woman is seen with black paint on her face as another white woman laughs. But as students and university officials took their turn at the microphone, many said they need to see more from campus leadership. Suzette Grillot, the former dean of OU’s College of International Studies who was fired from her post last week, asked university President Jim Gallogly, who was sitting in the front row, to resign. She held up a sign that read “Resign now” and dropped it in Gallogly’s lap, prompting cheers from many of the students at the rally. Gallogly said afterward that he had no plans to resign and was working to accomplish many of the goals outlined by OU’s Black Student Association, including adding a zero-tolerance policy on hate speech to the student code of conduct and hiring more African-American faculty and staff. “I’m here trying to do a good job for our students and the taxpayers of the state of Oklahoma,” Gallogly said. Student Courtney Patterson echoed the calls from the OU Black Student Association and said he wants to see the administration do more to teach those goals. Before Tuesday’s rally, Gallogly also met with Native American students, one of whom performed a cedar burning prayer and another who marked his face with Oklahoma red clay as part of an indigenous ritual of protection. “I really hope the administration takes on our voice and that they actually listen to us,” said Lauren Noriega, a sophomore from Lawton and a member of the Comanche Nation. The university said the written apologies, in which both women said they never intended to hurt anyone, were sent to the Office of University Community on Saturday, a day after the video surfaced. Gallogly announced Monday – noting it was Martin Luther King Jr. Day, which honors the slain black civil rights leader – that both women had voluntarily withdrawn from campus. Phone messages left Tuesday by The Associated Press at numbers listed for Urban and Ford were not immediately returned. The University of Oklahoma Tri Delta sorority chapter also said in a statement that it has removed one of the women from membership. The university severed ties with a fraternity in 2015 after several members took part in a chant caught on video that referenced lynching. 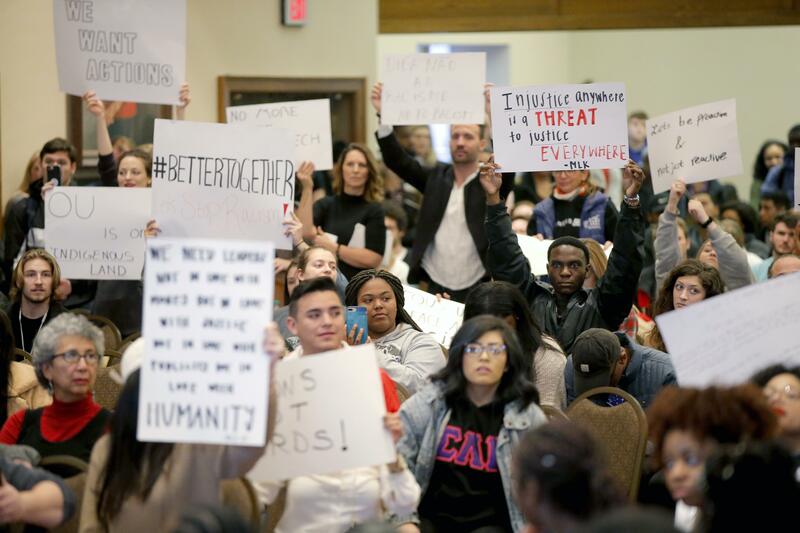 Gallogly said Monday that having a second incident just a few years later shows that “there must be something systemic” and that the campus has work to do. Published: Jan. 22, 2019, 4:59 p.m.